Documents the devastating effect that oil and gas drilling is having on the health of families and the environment in the Rocky Mountain West. Note: This offer is for grass roots groups and activists only. Imagine discovering that you don't own the mineral rights under your land, and that an energy company plans to drill for natural gas two hundred feet from your front door. Imagine another shocking truth: you have little or no recourse to protect your home or land from such development. SPLIT ESTATE maps a tragedy in the making, as citizens in the path of a new drilling boom in the Rocky Mountain West struggle against the erosion of their civil liberties, their communities and their health. As our appetite for fossil fuels increases despite mounting public health concerns, SPLIT ESTATE cracks the sugarcoating on an industry that assures us it is a good neighbor, and drives home the need for alternatives -- both here and abroad. "Split Estate effectively dramatizes the concentrated costs regularly borne by those who reside on or near the underground energy resources that most of us take for granted. Even reasonably knowledgeable viewers are likely to come away with a heightened understanding of both the politically privileged position of our nation's extraction industries and the role that concerned citizens can play in holding those industries accountable." 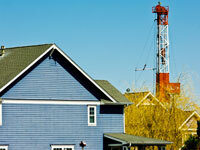 "Split Estate is an excellent and timely look at a critical issue in energy development. Our nation's headlong rush into energy development on public lands sounds fine--until the drilling rig sits outside your backdoor. The government's retention of mineral rights on millions of acres of private land will continue to destroy the lives and dreams of Americans until Congress confronts the split estate problem. Thanks for exposing this dirty little secret legacy from the past." "Split Estate is an eye-opening examination of the consequences and conflicts that can arise between surface land owners in the western United States, and those who own and extract the energy and mineral rights below. This film is of value to anyone wrestling with rational, sustainable energy policy while preserving the priceless elements of cultural heritage, private enterprise above-ground, and the precious health not only of people but the land itself." "Tells a powerful story about Americans living with the dirty side of oil and gas development in their own backyards. As oil and gas production expands to more and more places throughout the country, it is essential that communities have the information they need to support policies that protect our health and environment." "You tell an important and compelling story. You have captured brilliantly the issues and are helping tell the story that needs to be spread to a much broader audience." "A must-see film for any elected official who deals with natural resources issues and the impact that oil and gas extraction can have on a community. Anyone who sees the film will be changed by the experience - for the better." "I urge our elected leaders--especially those who make decisions about energy development and environmental health in the Rocky Mountain West--to confront and tackle the critical issues raised in this film." "We are fighting for our lives here in the Marcellus Shale in NY and PA. Your film may save us." The DVD includes two versions of the film, the full 76-minute version and a 15-minute version for discussion purposes. The DVD also includes extended interviews on the Health Effects and Oil and Gas Drilling with Dr. Theo Colborn, PhD, Daniel Thau Teitelbaum, MD and Dr. Kendall Gurdes, MD and on Legal Issues and Oil and Gas Drilling with Oil and Gas Plaintiff Attorney Lance Astrella. Also included are extras for activists, the movie trailer and scene selection. A rambunctious road trip reveals the toll that environmental deregulation has had on the lives of ordinary people. Connects the fate of the Arctic National Wildlife Refuge to critical decisions about energy policy. on of natural gas development, and perhaps persuade those who do not understand this, to say 'no' to this leviathan."